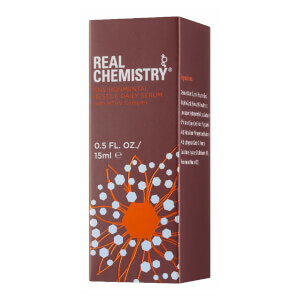 Protect your skin against the stresses of everyday life using Real Chemistry Environmental Rescue Daily Serum, an antioxidant-rich formula that eases discomfort and damage. Powered by the brand’s MTHV® Complex to strengthen the barrier function against UV rays, pollution and free radicals, the silky serum also uses Aloe to soothe irritation and redness. Skin is left calm, hydrated and visibly healthy. Day and night, apply a thin layer across the entire face and neck using 2-3 drops and before any other products are applied. For day, use under Environmental Rescue Essential Day Cream. Aqua, Butylene Glycol, Hydroxyethyl Urea, Saccharum Officinarum (Sugar Cane) Extract, Glycerin, Betaine, Propylene glycol, Laurocapram, Alpha Arbutin, Phenoxyethanol, Hydroxyethyl Cellulose, Hydrogenated Castor Oil, Polyglutamic Acid, Hyaluronic Acid, Menthol, Glutathione, Metallothionein (MT), Recombinant Hirudin (HV2), Fragrance.